I don't make regular trips out to Lake Nona. In fact, when I hear of new spots opening up that far out to the East, I certainly don't hastily grab my SunPass hoping it will be worth the time and gas. In reality, from Orlando's core the drive out to Lake Nona is a pretty easy twenty-five minute drive down the 417. But still I hadn't heard a lot about one of it's newest restaurants, but thankfully I finally found something worthy of the drive. 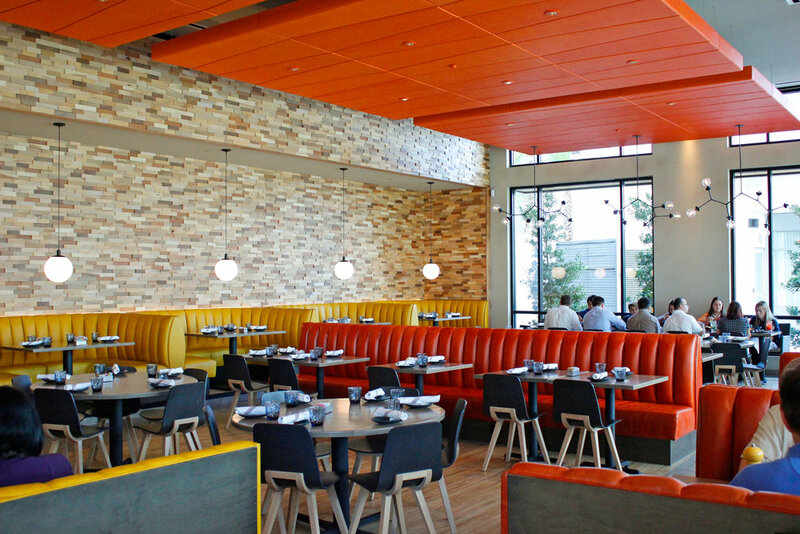 Chroma Kitchen + Modern is one of those places that I immediately wanted to love when I entered, but I had to go into it cautiously because beautiful restaurants in Lake Nona have burnt me before. Bright, rich pops of orange and yellow follow you through the bar and into the dining room, but OrlandoEats and I took a detour and sat on the patio which at night gives you a front row seat of the Beacon and Code Wall, a large public art installation.To begin Chroma has a great cocktail list along with several Florida brewed beers on tap if you like to drink locally. I found myself intrigued by their hand-crafted sodas. It was a hard choice with Black Cherry and Cuban soda on the list of options, but I wanted something refreshing to go with the beautiful patio weather we were enjoying so I opted for the Ginger Lime Rickey. 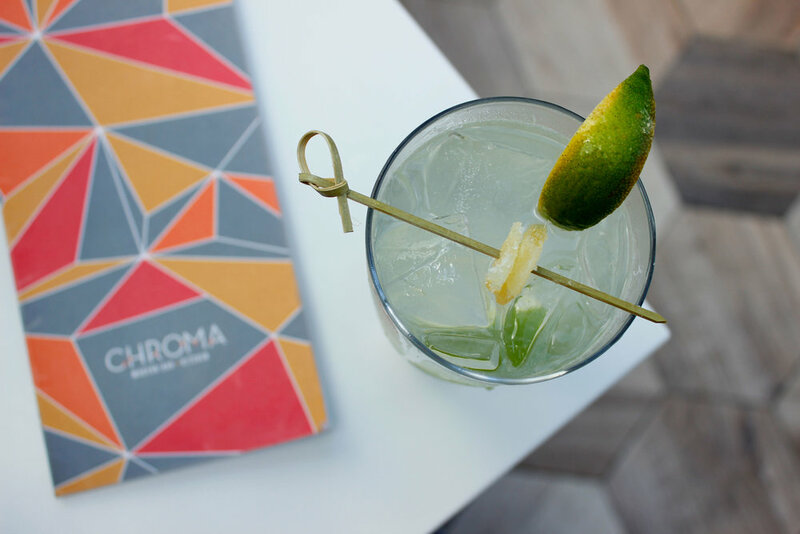 It's a blend of lime, ginger nectar, sparkling water, garnished with a piece of ginger candy. Also important to note their flavored lemonades come with one free refill which I thought was pretty gracious for a place like Chroma where they could easily get away with charging their guests anything they want. 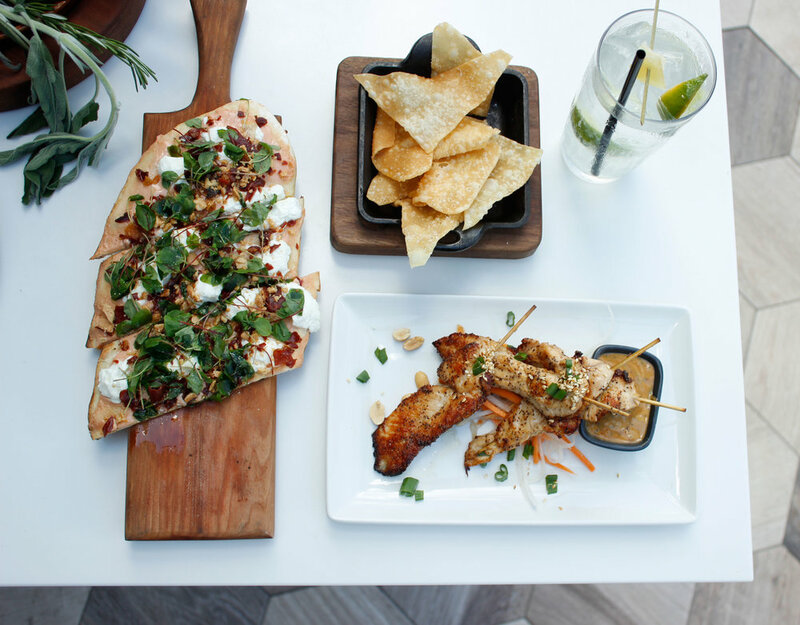 The entire menu is full of small plate options split into categories. The menu at first can seem a bit overwhelming, but our waitress helped us navigate with some of her favorites, promising to be honest if we picked something that wasn't a stand out to her. While I am certainly no bone marrow expert this dish was rich with flavor and juicy fats that spread nicely on the rustic bread. 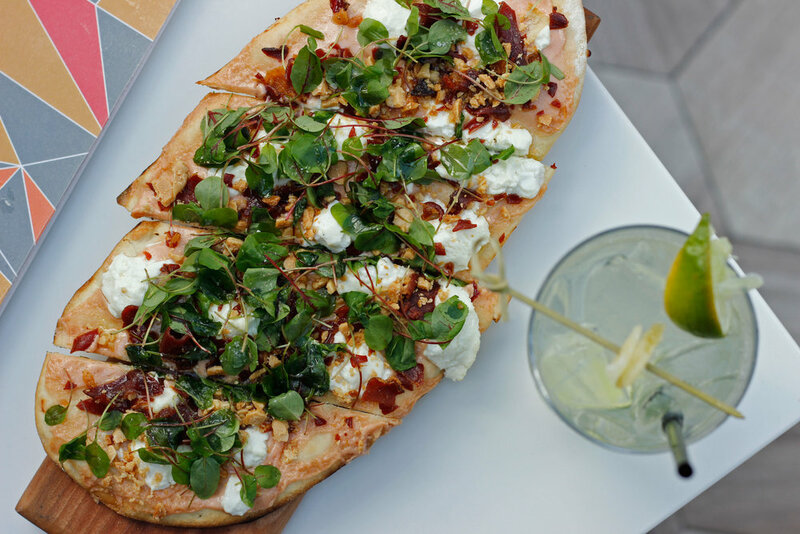 The Guava & Goat Cheese flatbread was a bit of a gamble that had a delicious pay-off. Accompanied with Speck Ham, Marcona Almonds and red sorrel, the sweet and savory balance was spot on.While no dishes disappointed, I think the Wild Tuna Poke was my favorite. The avocado cream that layered atop the tuna was rich with lime (often I find missing in most avocado dishes) which added a nice zest to the fish. I could eat this all day with a handful of the crispy wonton chips. The Chicken Satay was another dish full of flavorful bites, thanks in part to the awesome peanut sauce that came with it. I'm really picky about my peanut sauce and this one held it's own to some of my homemade favorites. Not everyone that offers sliders does it right. 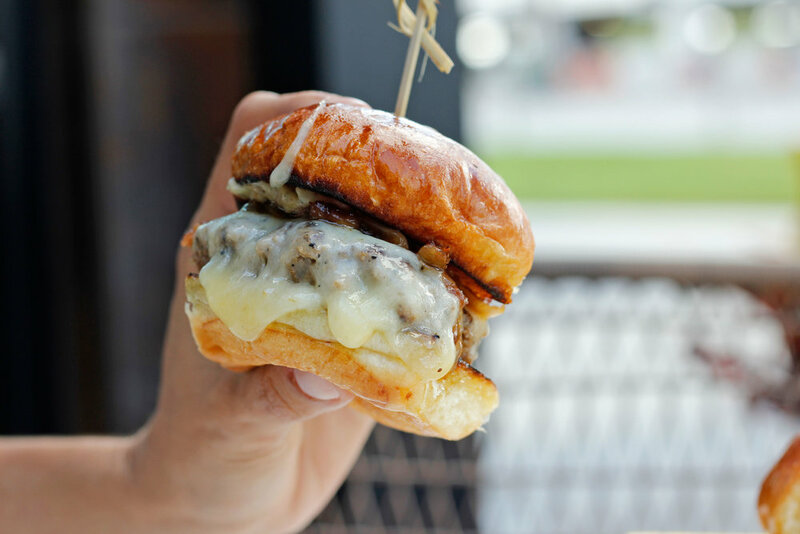 Thankfully Chroma kept it simple and juicy with their Cheeseburger sliders. Cooked medium as was requested, left the patties full of flavor as the aged white cheddar did the rest of the heavy lifting to make these great bites. I barely had room for dessert, but that's what great about their adorable sweet options. A few sweet bites can be chosen from their dessert tray (it looked like a sweet tool box to me) and you can finish off your meal on a indulgent note without going too far. I had a bit of the chocolate mousse that had an delicious orange zest burst. Perfect for a sunshine filled afternoon in Florida. By the end of our meal I was actually disappointed that Chroma hadn't been one of the many new restaurants to pop up closer to my side of town last year, because it is definitely a place I would return with family and foodie friends. I can't wait for Lake Nona to develop more (there are rumors of an outdoor movie theater) so it continues to give us city dwellers a reason to drive out East. Chroma invited me to enjoy this meal at no cost to myself but all photos and opinions are my own. You know it keep it 100.